When you are apartment hunting, prepare a rental search plan. Be sure to know in advance what you want in an apartment and what you can live without. Decide in advance what areas of the city you could consider living in and make a list of apartment buildings within that perimeter. Be sure to consider how far and how convenient it will be for you to travel to your job or your school or your family and friends. Also, how far is the apartment from stores, banks, hospitals, Church (if you attend) etc. If you have a car, make sure that there is adequate and convenient parking space 24/7. If you don’t drive make sure that there is close by public transportation. Narrow your apartment locating to the size of rental unit you need. Studio apartment or one bedroom apartment or 2 BR apartment or more. Are you considering a furnished apartment or do you possible need a short term rental. If you are renting an apartment with a cat, dog, or other pet, you need to find out which apartments allow renting with pets and which do not. And, if they do allow pets, is there an additional security deposit required and if so, how much it is. Do you need an apartment complex with an exercise room or tennis courts or a pool or a recreation room, etc. or do you simply need and desire a nice clean and quiet pad. Be realistic about what you can afford. Most apartment renting guides suggest that your rent should not be more than 25% to 30% of your income. This can vary depending on the income bracket, but be sure to be “real world” when budgeting additional apartment expenses such as heating and air conditioning and other utilities. If you fall short of affording the apartment of your choice, you might consider sharing an apartment with a roommate or roommates. Keep in mind that living with roommates can help you afford an upscale apartment or even, in some cases, luxury apartments, but it also has extreme restrictions to your privacy. If you are familiar with the area and its neighborhoods, that gives you a distinct advantage for your apartment search. 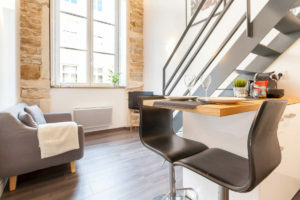 If, however, you are relocating to a new city or are not particularly knowledgeable about the city, you may want to contact an Apartment Locator or an Apartment Finder. Once you narrow your search for apartments down to apts which suit your needs and desires you must be well organized & well prepared for your visits to the apartment complexes. When inspecting the rental premises be on the alert for unsafe conditions, excessive noise from traffic or playgrounds or neighbors. Visit the apartment building at night as well as the daytime hours. This will give you a more comprehensive understanding of the total space you will be residing in. When you find the apartment complex that meets your renting needs and desires, you must be ready to put your “best foot forward” when you meet the apartment’s rental agent. This person may be the apartment building manager or a renting agent for the apts. You should prepare for this apartment renting interview in a professional and intelligent manner. Be advised that you are going to be asked to provide proof that you are a reliable prospective tenant. You are most likely going to need references from previous landlords. You may also be required by the apartments to show that you are gainfully employed and can afford the rent. Many landlords may require a credit report. If you are a first time renter and/or you have limited credit history you may be asked for references from family, friends, employer, professionals, etc. Likewise if you are renting with bad credit you will certainly want to come to the interview with a strong selection of references. You are not necessarily restricted from apartment renting with less than perfect credit, but you may be required to put up an additional security deposit and possibly have a credit worthy person co-sign the apartment lease with you. Don’t unprepared for by requests for any of these things. Be sure to fill out a 100% truthful apartment rental application and come to the interview with references, proof of employment, credit information and any other renting resources at the ready. If you do have a credit history or renting history that might be detrimental, going through an apartment locator or apartment finder may be the best solution. They will present your history to the landlord for you, (make sure they are 100% truthful about it) and they can also be quite helpful and save you a lot of time because they most likely will know which landlords and apartments are more lenient in these circumstances. They can also advise you as to exactly what kinds of references and documents you might need to prove that you can be a responsible tenant. Once you have located your “dream apartment”, or as close to your perfect apartment as possible, now it is necessary to pay extremely close attention to the particulars of the rental agreement. An Apartment Lease is a contract between you and the landlord. Once agreed upon and signed by the tenant and the landlord, the rental lease creates obligations and restrictions for both parties. The most obvious covenants of the apartment lease are the length of the rental, (Six month lease, one year lease, two year lease, etc.) The amount of the security deposit, when the rent is due, who is responsible for what utilities. Also in that apartment lease, however, are stipulations, (sometimes in small print) that can cover a great variety of landlord and tenant obligations and restrictions. * And the list goes on and on and on. Prospective tenants should read an Apartment lease thoroughly. Prospective apartment renters should understand everything that is contained in that lease and make an informed decision to be 100% accepting of all the provisions for both the tenant and the landlord, that you are positive that you can live up to your end of the bargain and that you are comfortable with the provisions on the landlord’s end. If you do not understand every single clause of that apartment lease then do not sign it until you do understand it. If necessary and if possible, request assistance in interpreting the lease from a trusted source such as a knowledgeable friend or family member or employer or professional, or anyone else who can understand it and explain it to you. If necessary get legal advice. It can cost additional funds if you do not qualify for free legal assistance, but that additional cost might save you a ton of money and save you a ton of heartache and aggravation down the road. If you do not agree with any of the provisions of that apartment lease and/or you feel that you can’t live up to the tenant’s obligations, or if you are not in agreement with any of the landlord’s rights under the agreement, then do not sign the lease until/or unless it can be changed to your satisfaction. If the apartment rental agreement cannot be amended to meet your needs and desires and comfort level then do not sign the lease and do not rent that apartment. The Apartment Rental agreement that you sign as a prospective tenant will not change once you become the actual tenant of that apartment.